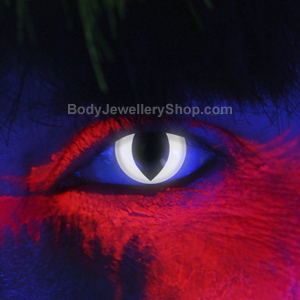 Make a bold statement this year with an eye-catching pair of UV contact lenses. These glossy UV lenses will look fabulous on and will definitely get you in the party mood. Everyone will want a pair of fantastic quality and value lenses to wear to all their special occasions. Light up your look with an attractive pair of yellow UV contact lenses which will glow under UV light. The plain design and eye-catching colour will instantly spice up your style in an instant. 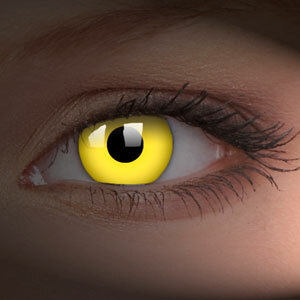 Make sure you grab a pair of these comfortable and light yellow lenses perfect for parties, clubbing and fancy dress. These bright yellow EDIT lenses will work well with our fabulous Batgirl deluxe fancy dress outfit and Disney Mad Hatter fancy dress costume. Everyone will be amazed with your quick transformation and will be immediately attracted to your shimmering eyes. Leave your party guests in a trance with our hypnotic red swirl UV contact lenses, perfect for special occasions and parties. These clear lenses with a red swirl will glow brightly under UV light, so make sure you wear these when you’re out clubbing. They have a 1 year life span and a 38% water content which will pamper your eyes all year round. Click on the image to the left to purchase your pair of vibrant swirl UV lenses which will definitely amaze all your friends. 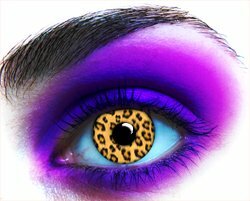 Unleash your wild side with these amazing white cat UV contact lenses. 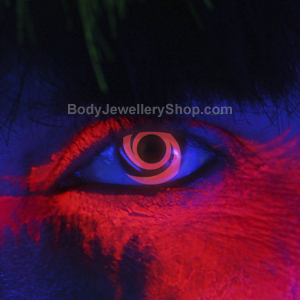 These white lenses with a black vertical pupil will shimmer under UV light. Your eyes will feel hydrated, fresh and very comfortable thanks to the exceptional 38% water content. Our incredible cat design lenses will look great worn during the day and the night, so make sure you get your own pair before they all sell out! This entry was posted in Contact Lenses, Fashion Accessories and tagged Cat Contacts, Cat Eye Contact Lenses, Cat Eyes, Cat Eyes Contact Lens, Cat Lenses, Cats Eye Contacts, Cats Eye Lenses, Contact Lens, contact lenses, Halloween contact lens, halloween contact lenses, uv, UV Contact Lenses, UV Contacts, UV Lens, UV Lenses, White Contact Lens, White Contacts on November 11, 2011 by Piercing Guru. If you want a classic cat eye contact lens you can’t go wrong with a green cat eye contact lens. Green cat contacts are perfect for cat costumes and I love them for Halloween, costume parties and dressing up. As well as cat costumes, these cat eye contact lenses can also be used for a variety of creatures â€“ snakes, lizard people, magical creatures and all sorts of science fiction costumes. To â€œqualifyâ€ as a green cat eye contact lens, a lens must be green – obviously – and have a vertical pupil like a catâ€™s. There is a wide variety of green cat eye contact lenses available, from plain green cat eye contact lenses to funky patterned designs and different shapes to experiment with. This entry was posted in Contact Lenses and tagged Cat Contacts, Cat Eye Contact Lenses, Cat Eyes, Cat Eyes Contact Lens, Cat Lenses, Cats Eye Contacts, Cats Eye Lenses on July 14, 2010 by Piercing Guru. Red cat eye contact lenses are a real classic and they are great for fancy dress costumes, Halloween and gothic fashions. Red cat eye lenses are red – obviously – and have a vertical pupil, like a cat’s eye. Traditional red cat eye contact lenses have a plain red background but you can also find lots of red cat eye lenses that have a slightly different shape, colour variation or pattern on the lens. Personally I love red cat eye contact lenses for Halloween – they are perfect for demon costumes, evil-looking cats, vampires and all sorts of spooky characters. The red really grabs your attention and the vertical pupil instantly gives you a freaky Halloween feel. This entry was posted in Contact Lenses and tagged Cat Contacts, Cat Eye Contact Lenses, Cat Eyes, Cat Eyes Contact Lens, Cat Lenses, Cats Eye Contacts, Cats Eye Lenses, Crazy Lenses, Halloween contact lens on June 8, 2010 by Piercing Guru. These ColourVue cat contact lenses have a classic design with a bright yellow background and a vertical pupil just like a real feline eye. They look great as fancy dress whether you’re going as an actual cat, a slinky catwoman or another costume. These cat eye contact lenses completely transform your look and they’re really shocking if you wear them with a regular outfit! And because these are ColourVue contact lenses, they feel very comfortable all day long. All ColourVue contact lenses are made from Hydrogel, a patented lens material that is 45% water, very soft and gentle on your eyes. It will keep your eyes hydrated all day long and personally I think it really makes a difference â€“ especially if youâ€™re wearing your Solar Blue lenses for more than a couple of hours. Cat eye contact lenses are really versatile and can be styled to look like snakes eyes, reptile looks and all sorts of alien creatures. They are a very popular type of lens and at Body Jewellery Shop we have lots of cat eye contact lenses from different brands and in different colours. If you want a realistic cat eye itâ€™s best to stick with a yellow,, green or amber-coloured cat eye contact lens. This entry was posted in Contact Lenses and tagged Cat Contacts, Cat Eye Contact Lenses, Cat Eyes, Cat Eyes Contact Lens, Cat Lenses, Cats Eye Contacts, Cats Eye Lenses, color contacts, colour contact lenses, Coloured Contact Lens, Coloured Contact Lenses, Coloured Contacts, Coloured Lenses, Contact Lens, contact lenses, Halloween contact lens, halloween contact lenses, scary contact lenses on April 3, 2010 by Piercing Guru. Coloured contact lenses are the greatest new fashion accessories; transform your lookÂ within moments! These cat eye contact lenses areÂ available in different colours, including black cat eyes, yellow cat eyes, pink cat eyes, red cat eye lenses, green cat eyes and even combination colours (dragon eyes and lizard eyes). Whether you are preparing your fierce cat costume for Halloween, orÂ dressing upÂ for aÂ wild hen party, we have something for all occasions and costume ideas. Cat Eye Lenses are available in a great choice of brands, prices and colours. You can even purchase some of the designs in single packs, so you can mix and match your colours of choice for a truly mesmerizing look. Cat eye lenses are fantastic accessories and make very unique gifts for Christmas and Birthdays… or just playing practical jokes on your friends! Who Can Wear Cat Eye Contact Lenses? Our contact lenses are suitable for everyone, they are safe to wear and are supplied with instructions on use. You do not have to have a prescription to wear our fashion lenses, as they do not alter your vision in any way; they are used for cosmetic (fashion) purposes only. Don’t forget to purchase some contact lens solution for storing your contact lenses, and a contact lens storage case to keep them fresh and clean until the next time you use them. Our contact lenses can be re-used but must be kept in clean and fresh solution after every use. This entry was posted in Contact Lenses and tagged Cat Contacts, Cat Eye Contact Lenses, Cat Eyes, Cat Eyes Contact Lens, Cat Lenses, Cats Eye Contacts, Cats Eye Lenses on November 11, 2009 by Piercing Guru.